Life with Lucy, David and Vivian: David . . . so big! 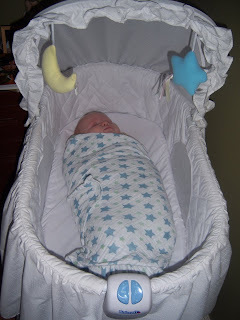 We kept Lucy in our room in the bassinet until she was 6 months old. We planned to do the same with David. 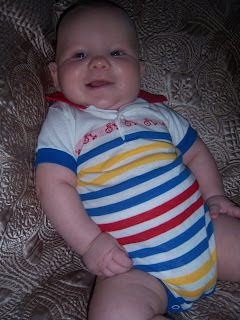 As you can see by the picture below, David is pushing his limits in the bassinet at just 3 1/2 months! It makes me happy to see him so healthy and a little sad to see my baby disappearing right before my eyes. One more great shot of our little (or should I say big) man. He is truly a joy to have in our home. Love the chunk!! He's a cutie! i need one of those.....i big, lovable, huggable, chubby, baby boy! we love having a houseful of girls (and if this one is a girl as well, we'll be totally happy)... but i just know we have one up there in heaven waiting for us and this post makes me especially excited!